Course of the Force 2013: Team Hondo races to riches for Make-A-Wish! Course of the Force moved to southern California over the weekend, with Day 4 (Friday) of the relay going from Pacific Palisades to Santa Monica, and then Day 5 (Saturday) from Santa Monica to Huntington Beach, and Day 6 ending in Oceanside. There were conivals, movie screenings, and of course, fans young and old running with the lightsaber in the relay for Make-A-Wish. I went out to the Oceanside Conival on Sunday to meet up with my Team Hondo teammates and we had a blast – all before our big part of the relay on Monday morning! We’ve got the Day 4 recap video above, which has a really adorable Costume of the Day: an Artoo Dress, and there’s more photos over at the blog summary of the day, and some catching up with Robot Chicken writer Kevin Schinick. Also, the Day 5 recap from Huntington Beach, with some more celebrity runners, Jennifer Landa’s Millennium Falcon dress, and more. Plus the photos and text of day five, and a Behind the Saber with actor Danielle Panabaker. Day 6 had the sail barge cruise down the interstate from Orange County to Oceanside, where the relay picked up for a few more miles, then ended at a conival at the Oceanside Pier. 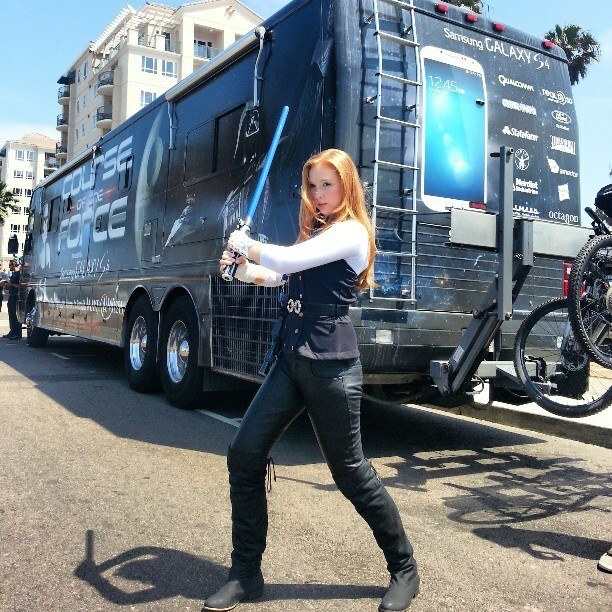 There’s the official write up with photos, including Castle‘s Molly Quinn as Mara Jade. I went out to the Conival to meet up with my fellow relay participants on Team Hondo. After some cool megasized Icesaber Otter Pops and taking some photos at the Cinemark booth, we relaxed in the sun to the Springsteen tribute band, Thunder Road. You can check out all my fun Conival photos on Flickr! Also, I got to photobomb Team HTown Jedi as they came in to the conival. While we had been leading them in the afternoon with fundraising, they’ve gotten the upper hand with a big donation late in the day. But you can show that pirates are better than Jedi by supporting me, or Dani and Lindsay! Team Hondo – Dani, Lindsay, and myself will all be running tomorrow morning in the Oceanside and Carlsbad areas in the 8 am to 10:30 am timeframe – watch #TeamHondo on Twitter in the morning for more details if you are in the area and want to cheer us on! The official Course of the Force recap video of the second day of the lightsaber relay is now up, hosted by Chris Hardwick, Carrie Keagan and Ashley Eckstein, with plenty of shots of the relay participants in San Francisco from AT&T Park to across the Golden Gate Bridge. Today, before heading down to southern California, the Course of the Force made some stops at some of the different tech giants in the Bay Area, visiting Google and YouTube. Check out more Course of the Force coverage from the first few days in the Bay Area. Course of the Force, the lightsaber relay from San Francisco to San Diego raising funds for Make-A-Wish, kicked off on Tuesday with a special celebrity run at Skywalker Ranch, then proceeded on Wednesday around San Francisco, ending with a concert and conival. Ashley Eckstein, one of the co-hosts of Course of the Force, was at Skywalker Ranch to help start the relay and covered it for the Official Star Wars Blog. 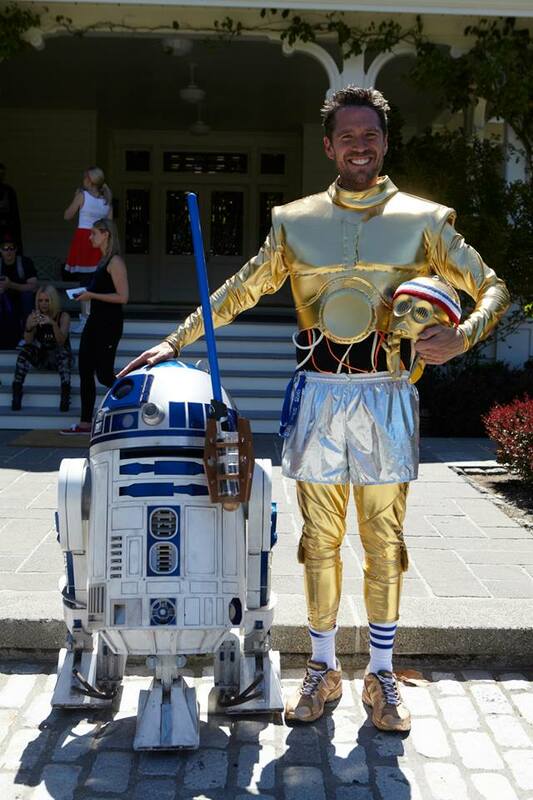 One of the celebrity runners at Skywalker Ranch was Alexis Denisof (Angel, Much Ado About Nothing), who blogged about his experience running in a spandex Threepio suit, while being cheered by his wife Alyson Hannigan and kids. Other VIP runners included Kyle Newman, Chris Colfer, Todd Roy & Adrienne Curry, and Jared Eng. Check out the official Course of the Force Day 1 Recap by Nerdist’s Dan Casey, as well as a plethora of photos of celebrities and members of the 501st Legion and Rebel Legion up at the Ranch. Day 2 started off in San Francisco’s South Beach neighborhood, and the relay continued along the bayfront, ending with a crossing of the Golden Gate Bridge, with 38 relay participants scheduled for the morning race. The Conival at San Francisco’s Justin Herman Plaza featured a concert by Journey Unauthorized, and had booths ranging from Otter Pops to Qualcomm and State Farm. Chris Hardwick joined co-hosts Carrie Keagan and Ashley Eckstein for the end of day dueling. My favorite costumes: a family dressed as the Avengers! Her Universe is making Course of the Force tees! Ashley Eckstein’s Her Universe will be selling these Course of the Force t-shirts and hoodies at the race’s “conival’ events and San Diego Comic Con. $5 from each tee and $10 from each sweatshirt will go to Make-A-Wish, and it looks like they’ll be sold online as well. On that note, if you’d still like to donate directly, Hondo has raised James’ donation goal to $750. Support Team Hondo and Make-A-Wish! Help Team Hondo make their Course of the Force goal! Our own James is once again taking part in Course of the Force, and you can help him meet his fundraising goal. Despite the involvement of Hondo, the donations will be going to Make-A-Wish. With less than two months to go for the second annual Course of the Force lightsaber relay prior to Comic Con in San Diego, Nerdist Industries has kicked off a multi-part webseries to help promote the relay that supports the Make-A-Wish Foundation In this first episode ‘Lightsaber’s Lost’, Matt Mira goes to Lucasfilm to pick up this year’s lightsaber, only to find that it has been stolen, and has to report in to Chris Hardwick. Also, R2-D2 quotes Office Space and dances like JT. The 2013 Course of the Force relay will be headed from Skywalker Ranch all the way to San Diego from July 9 to July 16. Will Matt Mira retrieve the missing lightsaber in time? Is he really our only hope? (Hint: There is a another, if Wil Wheaton is available). New webisodes will appear every Tuesday from now until July 2. In other Course of the Force news, all of the relay spots for the San Francisco and the Pacific Beach to San Diego legs of the relay have been filled, and they are now taking a waitlist for those two sections. Sponsor Otter Pops is giving away a free spot in the relay to someone willing to show their Otter Pop pride! Course of the Force is back, this year starting at Skywalker Ranch! Course of the Force, the lightsaber relay to raise money for the Make-A-Wish Foundation, is coming back for its second year, and this time it’s going to be even bigger! Announced by Chris Hardwick of The Nerdist on Jimmy Fallon’s show, this year’s Course of the Force will start all the way at Skywalker Ranch on July 9, north of San Francisco and wind its way down to Comic Con San Diego on July 16. Registration is now open, with participants carrying the Course of the Force lightsaber (often in costume) for a quarter mile. This year’s fee is $150, which is much lower than last year’s inaugural race fee, but 100% of the proceeds go to several California chapters of the Make-A-Wish Foundation: Bay Area, Greater Los Angeles, Orange County and the Inland Empire, and San Diego. In addition to the leg of the relay for that day, Course of the Force hosts a public ‘Conival’ in the afternoon and evening, with cool bands, giveaways, and more. I ran in Course of the Force last year, which was like an Olympic torch dream and Star Wars dream mashed together to come true. It really was a fun experience that helped a good cause and brought fans of all kinds together. 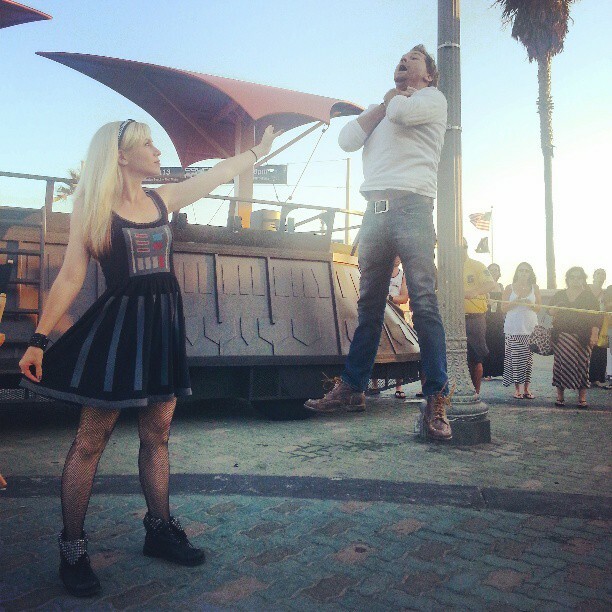 Last year, Her Universe’s Ashley Eckstein was a co-host of the event, providing daily video recaps after each day’s leg with Chris Hardwick from the Sail Barge, and Peter Mayhew was also a guest. So who knows who might show up this year! 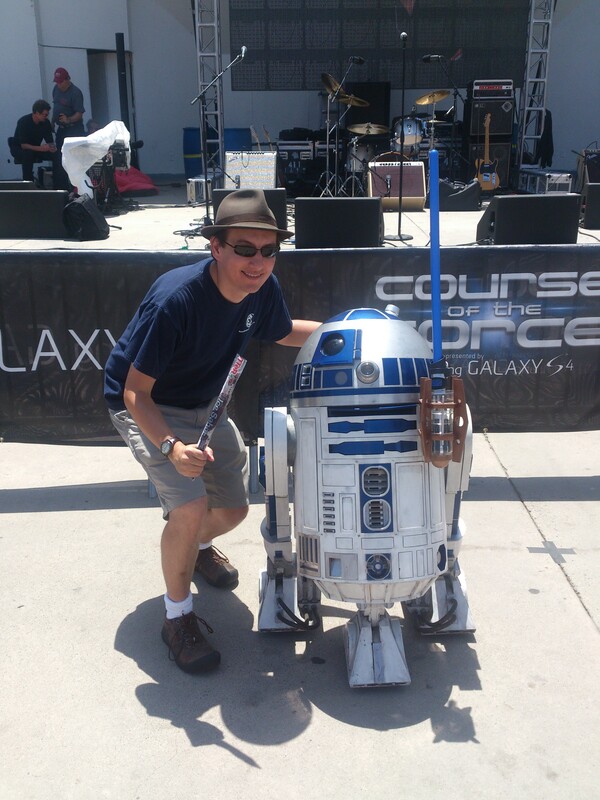 If you can, come join the fun – either by being a relay runner/walker, coming to a Conival, or simply helping raise funds for Make-A-Wish through Course of the Force! The relay is sponsored by Nerdist Industries, Lucasfilm and Octagon Events. For more info, just visit CourseOfTheForce.Starwars.com. So yesterday was Day 4 of Course of the Force, the lightsaber relay from Santa Monica to Comic-Con in San Diego to raise money for Make-A-Wish Foundation, and I was super excited to be able to participate in this fantastic experience as it came through San Diego. When they put out a call for local Star Wars fans to get involved, Caitlin and I signed up and went out on Tuesday morning for our afternoon segments. I was joined by all sorts of great fans, some of which are highlighted in my video above. This was my chance for an Olympic geek dream!